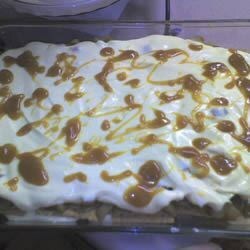 "This delicious no-bake dessert combines apples, vanilla pudding and cinnamon graham crackers topped off with a caramel icing. It's best to refrigerate it for 24 hours to let the dessert have time to form a cake-like consistency." Combine the apples, cinnamon and sugar in a saucepan and set over medium heat. Cook, stirring occasionally, until the apples are tender. If the mixture ends up with a lot of liquid, mix in a little bit of flour, and simmer until thickened. Remove from the heat and allow to cool to room temperature. In a large bowl, whisk together the instant pudding and milk until smooth. Stir in the sour cream and fold in the whipped topping. To assemble the cake, line the bottom of a 9x13 inch baking dish with a single layer of cinnamon graham crackers. Use a slotted spoon to make a thin layer of the apple mixture. Top with a generous layer of the pudding, about 1/3. Repeat layers until you have three layers of apples and pudding and four layers of crackers. Warm the caramel apple dip in the microwave oven until it can be easily poured. Pour this over the top layer of graham crackers. Refrigerate for at least overnight, but up to 24 hours before serving. I made this recipe for a school function, so I made it into individual servings, the kids liked it but when I sampled one I thought that the bottom graham crackers end up too soft and mushy. This was a great success at a work party. I used all fat free and low fat products. It tasted great and was guilt free! We all could not put our spoons down...beyond good. I've had friends and neighbors clamoring for the recipe. I make sure to send them right here. Awesome! I took this to a family dinner and it was gone in a flash. I used a 10x14 pan instead of 9x13 and it worked wonderfully.